I have this workflow. It searches Numbers files I have. I keep these files in iCloud inside Numbers directory (default). Is this expected? What can I do to get around this? @nikivi Works for me, both with the search scope set to iCloud only, and with the search scope cleared to find the files elsewhere on my Mac as well. 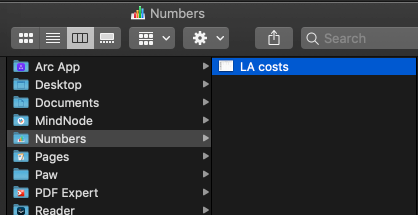 Check the state of the metadata for those files, and make sure you've got iCloud's "Optimised Storage" disabled, as the files won't actually be stored on your Mac if that feature is enabled. Thank you @Vero for the reply. Which looking at com.apple.iwork.numbers.sffnumbers seems correct. @nikivi It's hard to say whether it's still related to that previous issue you were/are having, as it's not something I've seen from anyone else. Can Spotlight find the files? Given how specific your path is, you could always remove the file types from the basic setup, as I'd imagine the Numbers app folder will only contain Numbers files. I also have a similar issue where Numbers files aren't shown in Alfred file search. I have several Numbers files in iCloud Drive and an Alfred file search will show some of them but not others. All files are present on the local disk and the metadata looks OK. What further information can I provide to help you look into this?